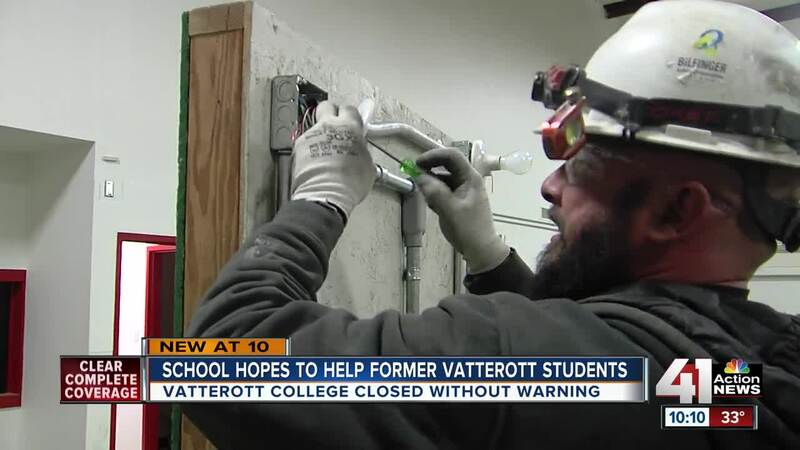 Days after the surprise closure of Vatterott College, schools are reaching out to help impacted students. Associated Builders and Contractors training school has offered to help place electrical students in programs at the facility. KANSAS CITY, Mo. — Following the surprise closure of Vatterott College this week, other schools around the metro are working to help get impacted students back on track. Vatterott closed its doors on Monday with no warning to students. Since then, institutes like the Associated Builders and Contractors training school have offered opportunities to them. Roberts-Bauer told 41 Action News that former Vatterott electrical students will be able to transfer credits to ABC to work towards getting certification. The closing of Vatterott College came after several other for-profit schools closed in the metro in recent years, including ITT Tech, Heritage College, and Wright Career College. Barad told 41 Action News that any prospective student of a for-profit school should research the school’s history and accreditation. A decision to enroll in one could lead to big loans and years of paying them off. With the metro once again dealing with the closing of a for-profit school, Michele Roberts-Bauer said it was important for former Vatterott students to know that help and resources are available for them.